The Miflex White Faced 52 mm diameter Slim Brass Tech Snap Submersible Pressure Gauge (SPG) is in a nickel plated solid brass housing with extremely transparent tempered glass. This SPG features an attachment point for a stainless steel shackle with bolt snap (sold separately). These gauges are popular with sidemount divers as they can easily clip the SPG in place instead of having it flopping about. Suited for technical divers, or top quality regulators, this gauge has double chrome mirror plated case treatment to assure maximum protection against corrosion. The brass housing with tempered glass gives extreme durability and the opportunity to use the gauge with no cover protection due to double welding and copper beryllium bourdon tube mechanism that never goes out of calibration even with hard shocks. 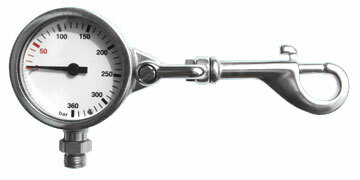 The gauge is used in technical diving and has a great degree of accuracy and reliability. Preferred for its simplicity by many technical divers or divers who follow the DIR training philosophy. This is a compact and robust cylinder pressure gauge, which provides outstanding accuracy and durability. The Miflex Tech Snap SPG is suitable for up to 300 bar cylinders and has a 400 bar maximum value display. The colour coding on the dial is red screened from 0 to 50 bar for reserve air. Numerical pressure increments are 50, 100, 150, 200, 250, 300, 350 and 400 bar with 20 bar increment indicators. This pressure gauge has standard 7/16" UNF threaded fitting compliant with the ISO 263 standard for connection with demand controls (regulators). The pressure gauge is a Category III device as defined under European Directive 89/686/CEE, and complies with the specifications set out in the European Standard EN 250/2000. This SPG has been tested and CE certified by Registered Test Centre #0426 in Italy. Gauge only: The stainless steel shackle with bolt snap is sold separately. Please note: High pressure (HP) hose and swivel-pin air-spool not included. If attaching this SPG to a HP hose, you'll need a swivel-pin airspool with standard shoulder design and standard or Viton O-Rings. After use, it is recommended to rinse the instrument in fresh water while it is still assembled on the regulator, to prevent water from penetrating inside the hose. Allow to air dry, and then put the instrument away, taking care to replace the special protection cap on the hose threading. The instrument should be stored in a dry place, protected from heat sources and direct light, without bending the hose too tightly (minimum bend radius 20 cm). The pressure gauge does not require any special maintenance. It is recommended that the 108 O-ring Viton gasket, located on the threads of the hose coupling which connects to the pressure reducer, be replaced periodically. Any maintenance or repairs must be performed by authorised personnel.